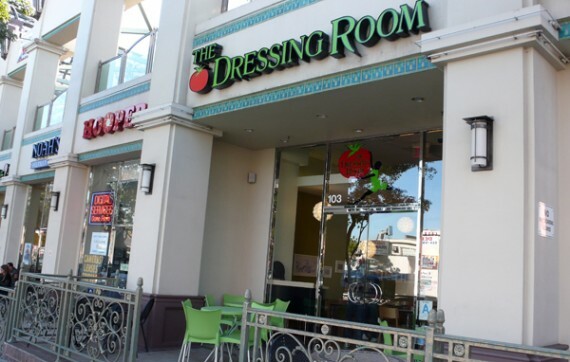 recently, i found myself in the valley and decided to check out sherman oaks’ all-salad restaurant, the dressing room. unfortunately, i was rather unimpressed. the dressing room offers tons of special salads, but the real draw for me was the create-your-own option. you get to choose the toppings for your salad and watch it made fresh, right before your eyes. i was so eager to check this place out—their website boasts that they offer 64 toppings and 16 styles of protein. oh boy! i was imagining all kinds of deliciousness. when i got there though, i realized the toppings were pretty basic and nothing to get excited about. carrots, onions, olives, blah blah blah. no hummus or tabouli or anything to get me worked up. 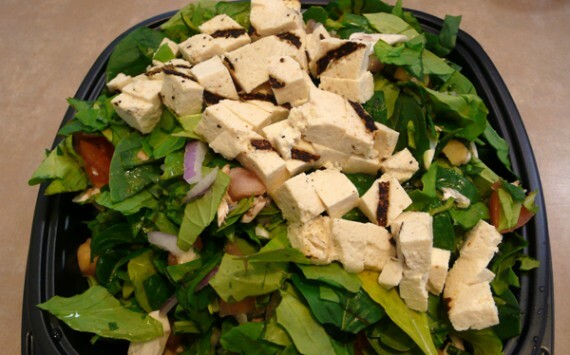 the protein choices for us vegans consisted of tofu, and tofu only….cold, grilled or blackened. i opted for grilled, which i was told is cooked on a separate part of the grill. yay. while my salad wasn’t bad, it was definitely uninspired. as i said, the toppings were kind of meh, and $9.20 was way too much to pay for this thing. the salad was huge, but it was mostly leaves—i think i got maybe 3 mushrooms total in the whole thing. i even overheard other customers complaining about their lack of toppings and one even went up to the counter to request some more. considering greens are the cheapest thing for the restaurant to provide, it’s lame that they give you so many in such and expensive salad. the tofu was also pretty bland; i poured half a bottle of hot sauce on my plate before it had any kind of flavor. while my salad was pretty blah, at least the dressing room provided a nice place in which to eat it. 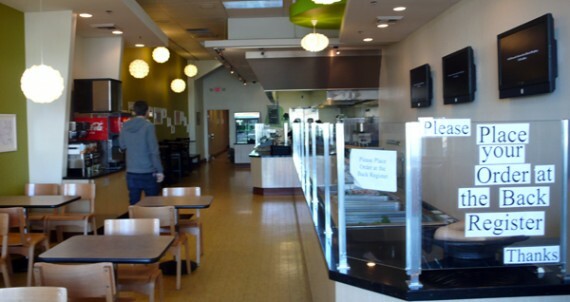 the restaurant has a pleasant interior with brightly colored walls and big lamps that look almost pinkberry-esque. i think they should work on their interior design a little less, and focus more on their salads. to be fair, my experience at the dressing room may not be the norm. i’ve read great things about it on very reputable sources like to live and eat in la and on yelp. so maybe i got them on a bad day or something. i just know i won’t be back. the place is way too expensive and the toppings don’t do it for me. for that much money i could get a huge salad at whole foods filled with all kinds of exciting stuff from the build- your-own salad bar. ah well, it was worth a shot!